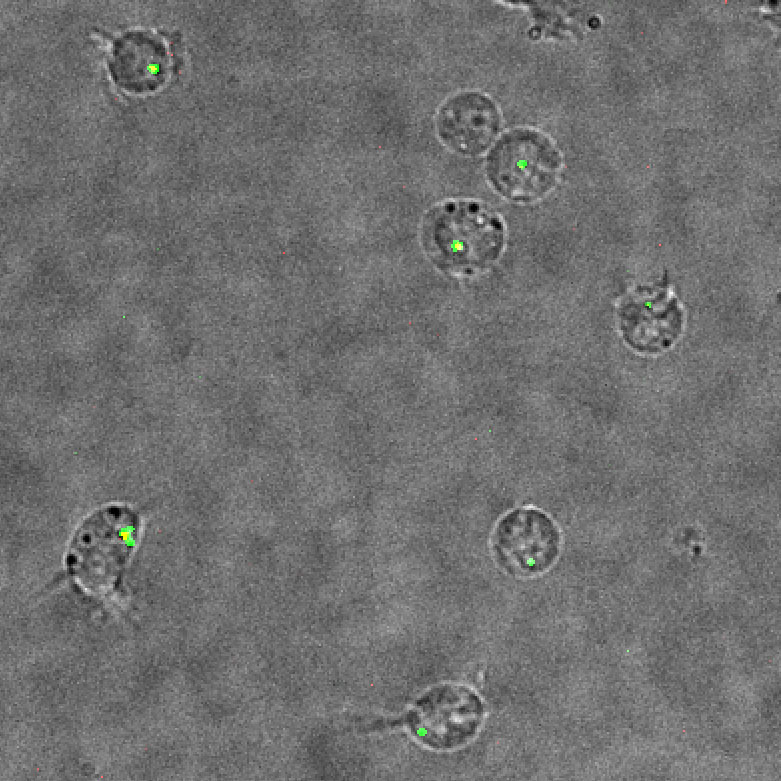 Northwestern Medicine scientists have developed a novel method of tracking HIV infection, allowing the behavior of individual virions — infectious particles — to be connected to infectivity. 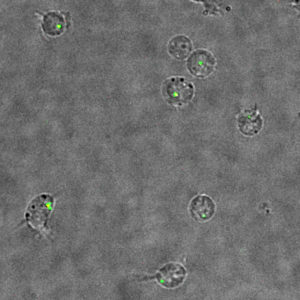 This image shows viruses challenging a cell, from a snapshot of the live-cell imaging used in the research. The findings, published in Proceedings of the National Academy of Sciences, could help lead to the development of novel therapies for HIV prevention and treatment by providing a deeper understanding of the mechanisms of HIV’s lifecycle. It has become routine to visualize the movement and progression of individual virions in cells, but the relevance of these observations was previously unclear, as many virions are defective or do not progress to make further copies of themselves. During the course of infection, HIV fuses onto a target immune cell and delivers its capsid — a cone that holds the genetic material of the virus — into the cell’s cytoplasm. From there, the capsid disassembles through a process called “uncoating,” which is crucial to the synthesis of viral DNA from its RNA genome and the hijacking of the cell’s functions. But the specific details of uncoating have been controversial, with two groups of thought. One believed that uncoating takes place late at pores, allowing factors to enter the nucleus. A second camp showed data suggesting that uncoating takes place early and in the cytoplasm. Thomas Hope, PhD, professor of Cell and Molecular Biology, was the principal investigator of the study published in Proceedings of the National Academy of Sciences. 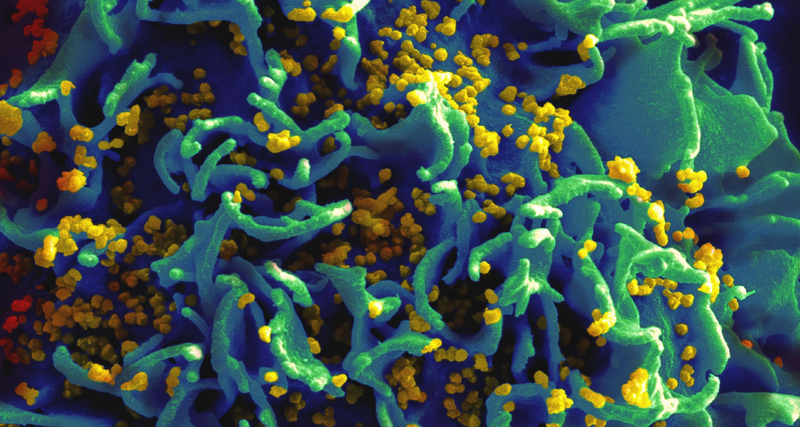 In part, the uncertainty persisted because previous methods in HIV research have been unable to distinguish between viral particles that actually lead to infection of the cell, and those that are irrelevant. In the current study, the team of scientists used a novel live-cell fluorescent imaging system that allowed them for the first time to identify individual particles associated with infection. In this case, they utilized the approach to monitor how the HIV capsid uncoats in the cell at the individual particle level. They demonstrated that uncoating leading to infection occurs early in the cytoplasm, around 30 minutes after cell fusion. The finding is just one example of novel discoveries about HIV that might now be possible with the imaging system. The study has implications in the wider field of virology research as well. “Theoretically, you could apply this technique to the study of any fluorescently-tagged virus,” explained first author João Mamede, PhD, a post-doctoral fellow in Hope’s laboratory. In future projects, Hope’s research team plans to continue to leverage the method to study infection in later stages of the HIV lifecycle. Hope is also a member of the Robert H. Lurie Comprehensive Cancer Center of Northwestern University. Other Northwestern co-authors on the paper include Gianguido Cianci, PhD, research assistant professor of Cell and Molecular Biology, and Meegan Anderson. The study was supported by National Institutes of Health grant P50 GM082545. Hope was also co-author of a separate recent study that uncovered important findings about a new family of neutralizing antibodies, discoveries that could help advance the development of an HIV vaccine. The paper was published in Immunity.